The Japanese version of Call of Duty: Modern Warfare 2 features a discrepancy in the localization — and content, it seems. In the section "No Russian", the player is told, "Remember, no Russian." Here, this means "Do not speak Russian," a plot point for this scene. 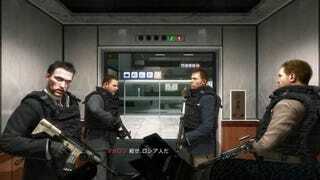 However, in the Japanese version, this is localized as "Kill 'em, the Russians." Players, it seems, will not be able to kill anyone in this scene. Actually, that's not entirely true. If players do shoot civilians in the Japanese version, it will automatically be "game over". It is possible to kill civilians in this mission in the Western version of MW2. This holds true for the game's bonus content as well. Call of Duty: Modern Warfare 2 has also been similarly censored in Germany. According to MW 2's Japanese publisher Square Enix, the game does not have an English language track. Call of Duty: Modern Warfare 2 goes on sale in Japan tomorrow. Thanks Lenny for the tip!